Is this the beginning of the end of free access ? Hundreds protest against government cuts to National Park budgets. Hundreds have marched across the English countryside in protest against government cuts to National Park budgets. The walks were organised by the Campaign for National Parks and online protest group 38 Degrees. A Yorkshire Dales National Park spokesman said "the authority was waiting with trepidation" for news of future cuts next week. Ms Howie said: "National Parks are national assets. They contain some of England's most breathtaking scenery, rare wildlife and cultural heritage and must be conserved for the benefit of all, both now and in the future. "There is real concern that Defra will have to make huge cuts to meet the government's £20bn savings plan over the lifetime of this parliament. "That is why we are calling on the government to stop cutting funding and make sure the authorities have enough money to protect our most iconic landscapes." Dartmoor could be forced to charge visitors if government spending cuts go any deeper, the head of the park authority has warned. Peter Harper said the country's 15 national parks had not ruled out charging. But he admitted that it would be difficult on Dartmoor because there are so many routes on to the moors. Mr Harper, chairman of Dartmoor National Park Authority, warned of "creeping decay and degradation" after the budget was cut by 40 per cent over the past five years, from £4.8 million to £3.5 million. Staff have been cut by a quarter. Now the Chancellor has warned that over the next four years spending could be cut by another 25 to 40 per cent. Mr Harper said that maintenance of public rights of way was already being affected, and he urged moor users to write to their MPs, councillors and newspapers. "We have been given a steer by the Defra minister responsible for national parks that he wants us to take the same route as the British Museum – which is to have core funding from the Government and then commercially funded projects. "What worries us is what the Government considers core funding." Dartmoor and Exmoor national parks yesterday hosted walks aimed at putting pressure on the Government. The hikes, arranged by the Campaign for National Parks and the pressure group 38 Degrees, were designed to highlight the Stop the Cuts campaign. Mr Harper said the budget for all 15 of Britain's national parks amounted to just 83p per person a year. "I don't think Whitehall understands that. To them we are just another Defra department. He urged Westcountry people to "let Whitehall know that these are treasured places. They are Britain's lungs. The nation has few places they can get out and enjoy." Dartmoor has teamed up with the other 14 national parks to form a new company, the National Parks Partnership Ltd, in a bid to find new solutions to the funding crisis. Dartmoor has tried to get a step ahead of the cuts over the past few years. It accepted a deal with Reckitt Benckiser, owner of the Airwick brand, but Mr Harper said their campaign was being withdrawn. Ashburton Motor Works has given an Isuzu D Max four-wheel-drive for head ranger Robert Steemson. This year Dartmoor is hosting the UK national parks conference, which is being sponsored by Bovey Castle, Zurich Insurance and a number of other companies. Mr Harper said these contributions were valued, but they would never go as far as an "Adopt a tor" scheme, or allowing companies to brand signs on the moors. 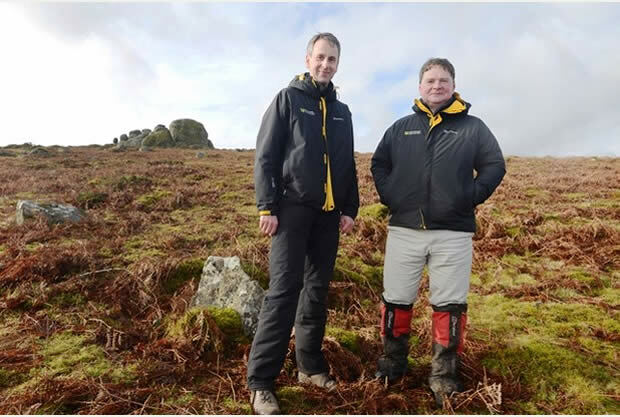 Head ranger Robert Steemson said: "The rangers are part of the high profile frontline public face of Dartmoor and the service has benefited over many years getting some good discounts from suppliers of clothing and other kit, but this is the first sponsorship arrangement we have had. A Defra spokesperson said: "National Parks are a vital part of our heritage, provide beautiful landscapes for us all to enjoy and are the cornerstone to many rural businesses. "That is why, despite reductions in Defra's overall budget, we have provided £260 million to National Park authorities since 2010. "As part of the spending review Defra, like other unprotected government departments, has been asked to find savings to contribute to the Government's commitment to eliminate the deficit. That process is under way and no decisions have been made." Should Dartmoor and other National Parks be allowed to charge for access?